As I write this, it’s an impossibly beautiful, crisp, bone-cold winter day outside. The sun, low on the horizon, fills the quiet suburban street with deceivingly golden light which masks the bitterly cold temperature. It’s glove weather. Scarf weather. Soup and takeaway bright orange curry weather. And here I come, with an ice cream recipe. But do people’s cravings for ice cream really depend on the temperature? Aren’t its creaminess, the tongue numbing coldness, the syrupy toppings best enjoyed in winter, in a room so warm that the windows steam up, perched at the edge of the sofa while nursing a stew or getting lost in a book or simply watching re-runs of Friends? You may disagree. That’s fine. Just serve this alongside some warm chocolate cake. You’ll thank me later. Let’s talk about the magic word. No, it’s probably not what you’re thinking. It’s ‘no-churn‘. If you love cooking and food and are as lazy as I am, you’ll know that little spark of excitement you get when you see this word printed on a magazine, or perfectly enunciated by Nigella Lawson. Yes, Nigella is back. Her kitchen looks a little different and she does too, but everything she makes is still quintessentially her, the soft focus close shots of her snow white skin and dark hair, the perfectly spoken alliterations in her recipes, the leftovers secretly eaten from the fridge at night. Her recipes have lost a little bit of indulgence -less bacon and lard, more avocado and protein-packed oat bars – but she’s still there, under a surface of green food. 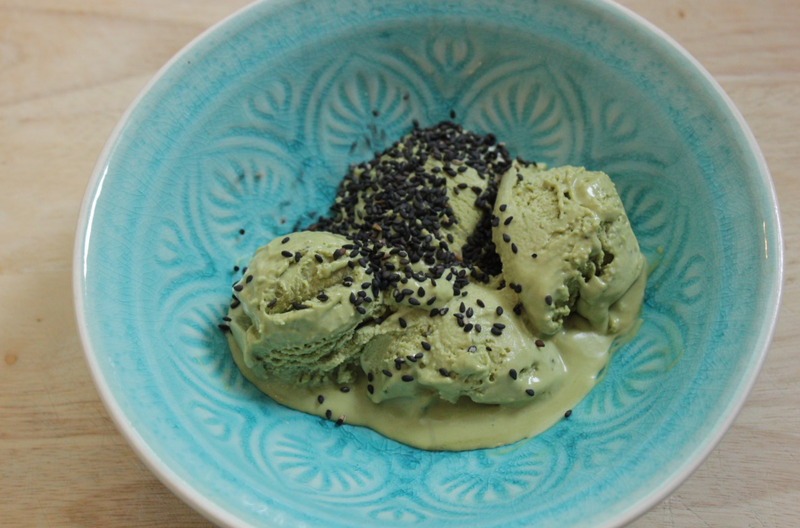 And speaking of green foods, this recipe makes the most perfect, impossibly green matcha ice cream. It’s a quintessentially Nigella recipe: surprisingly simple, indulgent, and utterly delicious. The aromatic, slightly bitter note of tea goes perfectly with the dense, thick, sugary creaminess of condensed milk, and it tastes exactly like a matcha latte – hence the name. The recipe is so easy you’ll want to tell everyone: a can of condensed milk, some double cream, green tea powder. And that’s it. What you get is spookingly similar to proper ice cream, minus all the effort, and it’s opened a world of possibilities. Could I make this with instant coffee powder? What about normal tea? Can I basically turn every powder into luscious ice cream? Stay tuned. I buy my matcha powder from Amazon – cooking grade is cheaper and will do just fine. I tweaked Nigella’s recipes a little as I found hers too sweet – however this may depend on the intensity of your green tea, so I would probably start with two tablespoons of powder and then add according to you taste. You could also try and add sesame seeds before freezing – I used mine as a topping, their subtle roasted nuttiness is a perfect match to the creamy sweetness of frozen condensed milk. Put the condensed milk in a bowl, and stir to loosen. Add the cream and whisk until it begins to thicken. 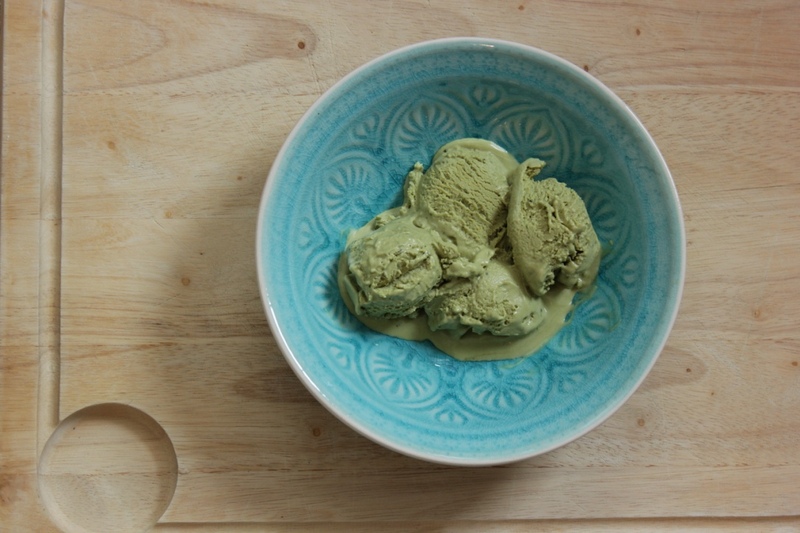 Whisk in the green tea powder until you have a thick whipped green cream. Decant into an airtight container and freeze overnight. Before serving, top with sesame seeds. You could serve this alongside a dark chocolate cake, but for me it’s best enjoyed on its own, in a sturdy bowl, a secret childish pleasure in spooning up creamy, dense and sugary ice cream, speckled with dark sesame seeds. As well as the sesame seeds, you could grate or even melt some very dark chocolate on top. Previous Post Salon, Brixton, and brunch.